Federal officials took a daughter away from a breast-feeding mother as part of the enforcement of the Trump Administration’s “zero tolerance” policy over undocumented immigrants. The immigrant from Honduras told the story to an attorney on Tuesday about the seizure as she was feeding her child in a detention center, while awaiting prosecution for entering the US illegally. When the woman resisted, she was handcuffed, according to Natalia Cornelio, the attorney with the Texas Civil Rights Project. Since Attorney General Jeff Sessions announced last month that all border-crossing parents would be taken to court and their children separated from them, about 500 juveniles have been put into centers, according to Miguel Nogueras, an assistant federal public defender for the Southern District of Texas. Some parents under arrest have told public defenders that they do not know what happened to their children. Some claim they have been told their children are being taken to be bathed or cleaned up, but then never see them again. 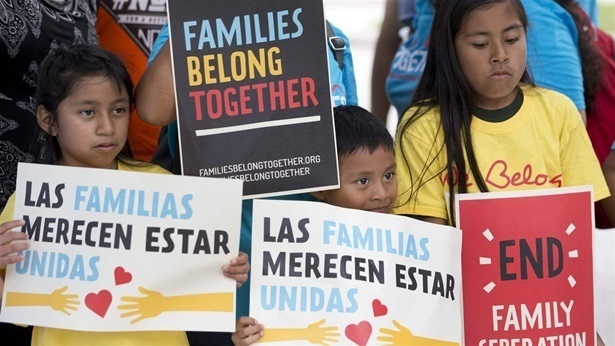 Earlier this week, Health and Human Services officials confirmed that they are looking at setting up “tent cities” — detention camps — for thousands of children on three military bases in Texas. And Attorney General Sessions withdrew asylum provisions for domestic violence and gang violence victims, potentially affecting tens of thousands of immigrants. It depends on who the agent is on that day. They’ll be told, “We’re going to separate your kids so they can bathe.” And that’s not true. It’s really hard to look in the eye of a mother or father who would plead to you — help me get my child back…. I’m outraged about it. I’m angry. It should never happen. I don’t think that this represents the values of the American people.